Provost Steven Lerman said that millions of dollars set aside for funding parts of the strategic plan this year will have to be cut this year. That's because the University needs to make up for last year's $20 million budget shortfall. 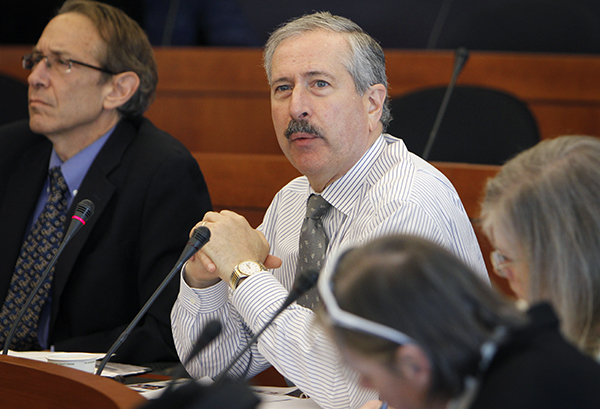 Provost Steven Lerman said the money had been set aside in the University’s budget to help fund its strategic plan, but had not yet been “obligated” to specific programs. He said he hoped to add the money back into the budget in the future, but that would have to come after the University makes up for last year’s $20 million budget shortfall. The $8.2 million is just 3 percent of what the total plan is estimated to cost. Still, cutting from strategic programs could hold back the University from achieving its ambitious goals, experts said. Last year, GW lost about $10.9 million in estimated revenue when graduate enrollment dropped. The University spent an extra $10.6 million that officials didn’t anticipate, but has so far declined to say where it overspent. Part of those losses have already been made up through a hiring freeze, the elimination of a vice provost position and cuts to areas that support University President Steven Knapp and Executive Vice President and Treasurer Lou Katz. Vice Provost for Budget and Finance Rene Stewart O’Neal explained the cut to strategic plan funding in a meeting with the Faculty Senate’s finance committee several weeks ago, economics professor and committee member Donald Parsons said. Parsons said the University has not been transparent enough about what led to the $20 million shortfall, or whether it expects those unanticipated costs to continue. “I’m sure in doing the strategic plan, they realized some years we may get extra funding and in other years we may have to cut,” Garris said. The strategic plan, which will cost GW nearly $243 million, was approved by the Board of Trustees in May 2013. Goals in the plan include changing the way undergraduates apply to the University, hiring more research-minded faculty and launching interdisciplinary research centers worth $30 million. GW will pay for most of those costs through fundraising, but will also need to budget for some of them. The plan does not specify which areas will be covered through fundraising, though donors often prefer to give to scholarships or endowed professorships. About $5.2 million is also expected to come in annually through new revenue and savings generated by the Innovation Task Force. But Noel Radomski, the director for the Wisconsin Center for the Advancement in Postsecondary Education, said the cuts to strategic plan funding could point to misplaced budget priorities. “It calls into question the validity of the plan itself and it calls to question what are, in fact, the priorities of campus leadership. This suggests there are other priorities,” Radomski said. Radomski said GW should “protect” its strategic plan by making cuts in other areas or eliminating some positions or programs. The strategic plan could encourage donors to give to the University, bringing in money that could then fund additional programs, he said. “It sends mixed messages, especially to prospective donors. They need to get funding to advance their strategic plan – that’s sending a bad message,” Radomski said. This article appeared in the November 4, 2014 issue of the Hatchet.